The majority of visitors come from Jordan. 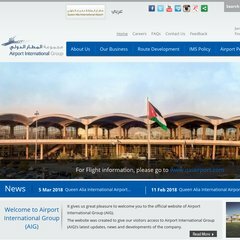 Topics: Vision, Mission, And Values, Shareholders, Qaia, and Traffic Growth. 42 users visit the site each day, each viewing 2.00 pages. The site is programmed for PHP/5.2.17. ns1.tierra.net, and ns2.tierra.net are its DNS Nameservers. It is hosted by Cologlobal (Ontario, Toronto,) using Apache web server. PING www. (67.22.134.150) 56(84) bytes of data. A ping to the server is timed at 10.9 ms.